I’ll never forget the opening scene of the film French Kiss. In it, we hear the dull moan of an aeroplane’s engine and the fake cheerful voice of an air-hostess speaking over the intercom. Then a scared Meg Ryan appears, hands clinging tightly to her chair for dear life, singing her ‘take off mantra’ to try and calm her fear of flying. When it becomes too much, she whips off her seatbelt, runs to the emergency exit door and breaks it open and rolls out…only to see a number of people in white coats and clipboards looking at her puzzled. It was only a simulator. There are no lab coats or clipboards at Flight Experience QV though. The company, operating in all major Australian capital cities, is a leader in providing flight simulation entertainment but are now taking their flying expertise one step further with the launch of their ‘Fear of Flying’ course. While we may laugh at Meg Ryan comically breaking out of a plane, aviophobia (fear of flying) is a little more serious – affecting up to 25% of Australians and ruining countless family holidays and travelling opportunities. A fear of flying can exist for a number of reasons, but common causes include a fear of lack of control, turbulence or even stem from a single bad experience. Knowing this, the Fear of Flying course is designed to be tailored to each individual client for maximum success. What sets the course apart from others is its “three prong” approach – psychological, educational and practical. The four stages are carefully designed to tackle all areas of the problem, starting with a psychological session with a trained psychologist to identify the cause and plan the best treatment process. An interactive session with a professional pilot follows, learning about all the safeguards that are in place, with statistics showing that bee stings are actually more dangerous than flying! Stage three includes further psychological sessions to help mentally prepare you to ‘face your fears’ in the final stage – the simulator. Going into the Flight Experience simulator, I’m surprised at just how realistic it is. With the doors shut, seatbelts on, a view of Tullamarine airport projected in the window and the whirring sound of the engine starting, we really could be on a real flight. Only this time we’re in the best seats in the house – the cockpit! 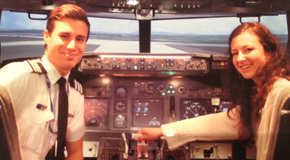 In this stage of the course, each participant gets to choose whether to observe or actually pilot the aircraft. The idea behind this is that “knowledge is power” – if you know how the plane works, you’re less likely to be fearful of it. Now, I’m not afraid of flying, but I still feel slightly nervous at the start of every flight and this one is no different. Yet taking the place of the pilot with all the controls at my fingertips, I feel strangely calm. My qualified instructor Michael talks me through exactly what I have to do and before I know it I’m flying the plane over Melbourne. In their promise of an individually tailored experience, any conditions can be simulated in the flight deck, from turbulence or bad weather to emergency landings. We experience a bit of rain and turbulence on our journey but manage to land back in the Flight Experience QV store just fine. The Fear of Flying course is available in Sydney, Melbourne, Brisbane, Perth and Adelaide.